You may also like. 2018 Unisex Girl/Boy Mascot Costume Outfits Party Festival Cosplay Fancy Dress. ONE SIZE FITS MOST. Adults 5’3(160cm) to 5. Cm tall and under 200 lbs weight. If you need larger or smaller size, please send us your height and weight. 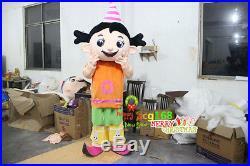 Mascot head, mascot body, shoe covers, hand covers, (tail). Head: EPE (not paperboard). Perfect Vision, Lightweight, Breathable & Washable Inside. Outter Fabric: Short hair velvet. Lining Materials: POLYESTER TAFFETA. 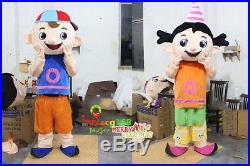 Filling Material in Mascot Costume body : polypropylene cotton. Total weight of custome(includes head) is only 4-6 lbs usually. Put into thick box, size : 10010090CM. Spot clean with a damp rag. For a complete cleaning after the costume has been worn several times, we suggest taking the costume to the drycleaners. Fur Costumes Hand wash or use large front loading commercial machine. Use cold water and mild detergent. Hang dry, do not use heat to dry! Foam Costumes Hand Wash or dry-clean only. Head Use upholstery spray foam cleaner or mild detergent and damp sponge. Do not soak or immerse in water. Head material:the head material is EPE, it is different from the paperboard material that now most of costume head are made with. Light: The head material is EPE, so it make the head lighter than paperboard material, and the user can wear it for a long time, and not feel very tired , and not add the shoulder pressure. Head material: We use the advanced machine to manufacture EPE head, it is stronger and enough hard to avoid to break when it meet strike accidentally , User head can be protected very well, but paperboard head was produced by paperboard pieces, they was usually agglutinated by the bad gluewater , this kind of head is not very firm, and very easily to turn into fragment, At the same time, the gluewater do harm to the User, It makes the User headache or feel unhappy. Breather and vision: User can breath very well when he wears it, there are the hole of eyes and mouth and the neck area, They have enough ventilation for User, User have a good vision from the head eyes or mouth. Eye net: there are plastic net on the costume eye, They can prevent the dust or the others into the User eyes. Waterproof: EPE material can be Water resistance. 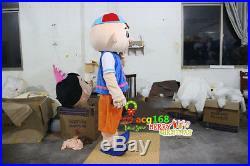 Costume fabric: We choose the high quality fabric for our costume. We fill polypropylene cotton Material in the middle of outer and inner fabric, It make the costume soft and verisimilitude. 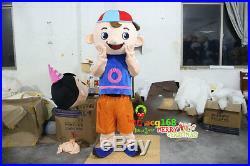 We can customize personal costume for you according to the pictures you provide or the material or size you require. Other countries or remote areas may take longer! Items are inspected by both ourselves and our suppliers own QC Department for signs of wear and sabotage. You must notify us immediately and return the item within 14 days of receipt. Please input a new order in the normal way. We are a company with rich experience in world trade. Founded in 2004, we are dedicated to serving our customers with great products and great service while keeping the quality high and the prices low. We also have rich products more than display in the store. The item “2018 Unisex Girl/Boy Mascot Costume Outfits Party Festival Cosplay Fancy Dress” is in sale since Tuesday, July 10, 2018. 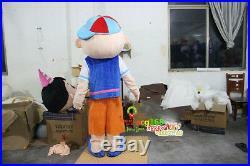 This item is in the category “Clothing, Shoes & Accessories\Costumes, Reenactment, Theater\Costumes\Unisex”. The seller is “yanyanyue_20160″ and is located in Beijing. This item can be shipped worldwide.